HFM on 11.1.2.4 and higher versions has a significantly different architecture than previous versions. This difference makes troubleshooting issues much harder. The old tricks seem out of date and it is easy to feel lost in the new version. Unfortunately, getting lost and unable to solve problems can lead to downtime and project delays. I wanted to share some basic tips to help get started in 11.1.2.4. Specifically, I wanted to focus on Windows because I have covered Linux in previous posts. First, let's take a real error while creating a brand new HFM application. The first thing to note is the old HFMErrorLogViewer from previous versions is gone. 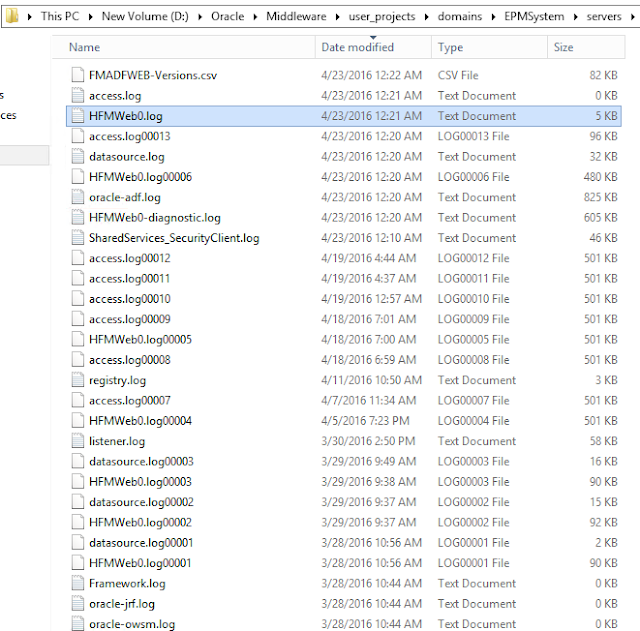 The HFMErrorLogViewer was a great tool because it collected all the backend log messages into one convenient place. Now it looks like things are spread out over many logs. The Java Server is the more interesting of the two for debugging because most significant errors can be traced to the backend. One thing to realize is HFM is still only partially Java based. There are still significant portions of HFM representing legacy code written in C. These low level functions are wrapped into this Java framework to make it look seamless. Let's take a look at some of the backend logs. The hsx-server log will have most details regarding the HFM backend service, similiar to the messages you would see previously in the HFMErrorLogViewer. [2016-04-23T00:29:44.485-07:00] [FM] [NOTIFICATION]  [oracle.FM.HSXDSLM.oracle.epm.fm.dslm.DatasourceProcessManager] [tid: 14] [ecid: 005CI7TJTRS8dplqwsedMG0006Vu001PXQ,0:1:4:21] [SRC_CLASS: oracle.epm.fm.dslm.DatasourceProcessManager] [SRC_METHOD: onProcessFailed] Datasource process for application TESTHFM999 stopped. From this log it is evident that each HFM application creates a new datasource. A datasource is a separate process that handles all the processing for a particular application. The datasource process is launched after creating the application, or on the fly as the application is accessed. 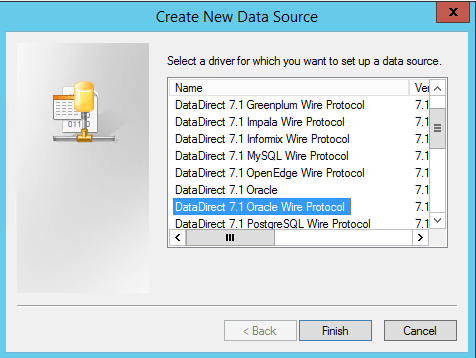 This spawned datasource process creates a new logfile for each application. For instance, a log file is created with the application name, such as xfm.odl.TESTHFM000-1.log. So it looks like ODBC is involved here. Essentially, the underlying database connection in HFM is now ODBC. This was done to support HFM on Linux. The ODBC layer is how Oracle choose to make the code OS agnostic. 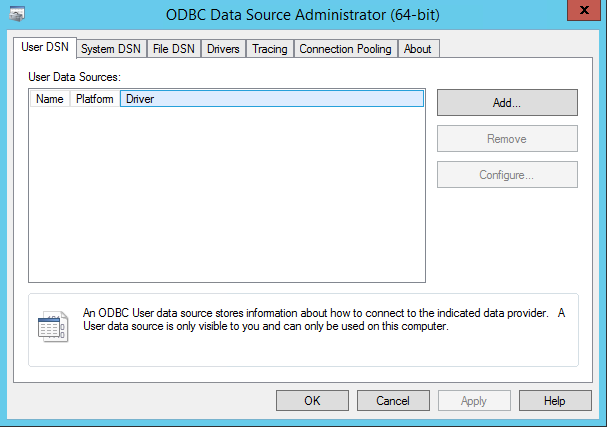 Open Microsoft ODBC Manager, and add a connection. The exact error message appears, outside of HFM. This error message also happens to indicate where to look to solve the issue. In this case, the Oracle Database Listener connection requires an encrypted connection. Unsecured connections are rejected. 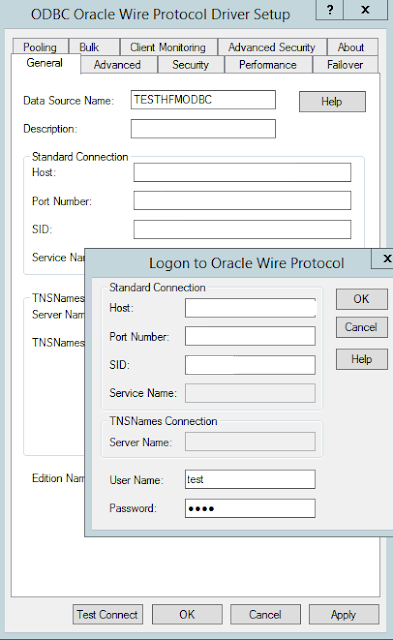 So we can simply configure the ODBC connection to use the same encryption as the Oracle Listener. In the ODBC connection there are Advanced Security parameters which allow us to easily match the listener settings. This is great. However, now we need to figure out where the ODBC connection is stored in HFM in order to configure these advanced properties. D:\Oracle\Middleware\dbclient64\network\admin. The ODBC connection leverages this HFMTNS connection information. Here there is some very interesting information about how this ODBC connection is stored. 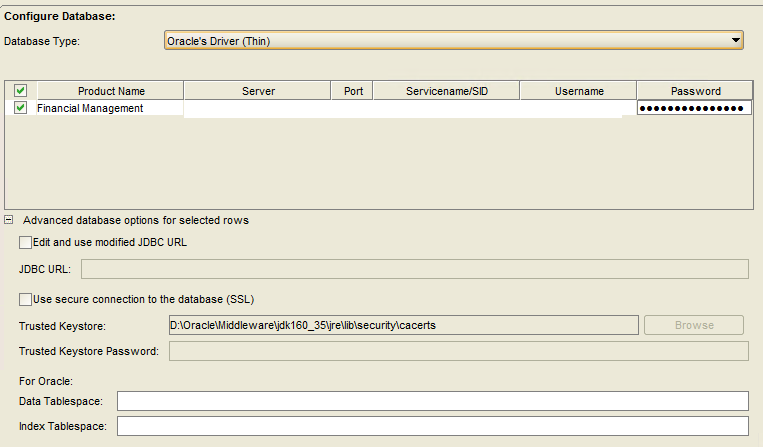 From the log message it looks like the ODBC connection is created on the fly by transforming the database connection information used by the Java HFM Service, JHsxServer. This comes from the database credentials used when running the HFM config tool during configuration. I find this design unfortunate because there are going to be slight differences between how Java drivers and the DataDirect drivers work for non trivial connections. Looking at the Config Tool advanced properties, there are options for SSL database connections, but all are focused on JDBC (Java) connectivity. 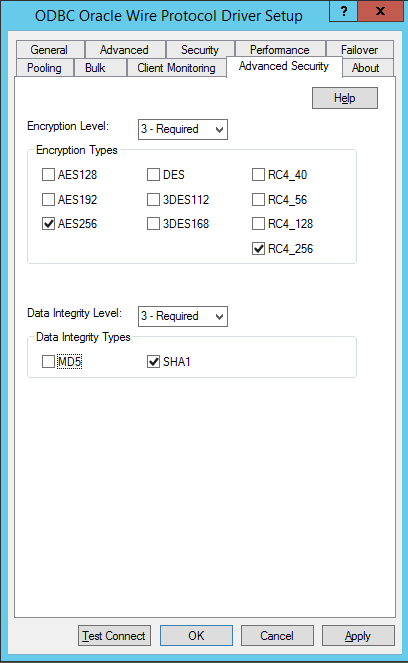 In this case, we see that the DataDirect based encryption properties cannot be set. Since there does not seem to be any way to change the advanced properties, The investigation has hit a dead end and Oracle SR needs created to get this fixed. Hi Nicholas, Were you able to fix this? We have a similar situation, We created few apps using copy app utility. 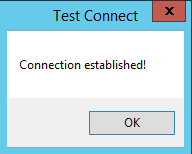 The apps are throwing this error intermittently and the log message is related to ODBC connectivity. Could you please let me know if you found a way to get around this? We have also got similar error. Is this issue resolved? I am having same issue while trying open Hfm app from workspace. Looks like we have confirmation that a fix is coming in the HFM 11.1.2.4.250 PSU. The rough ETA on this PSU is July. Hello Nick, This is a great blog. I am so glad to find it as I was troubleshooting an issue with HFM database connectivity issue. So good to see you after a long long time, man.